Webinar touches on strategies to get the most out of your feed. You invest a great deal in making top quality feed. Do all that you can to see that it reaches the dairy cow in the best condition and that she consumes it. This will minimize metabolic issues that could arise, as well as boost intakes and milk production. 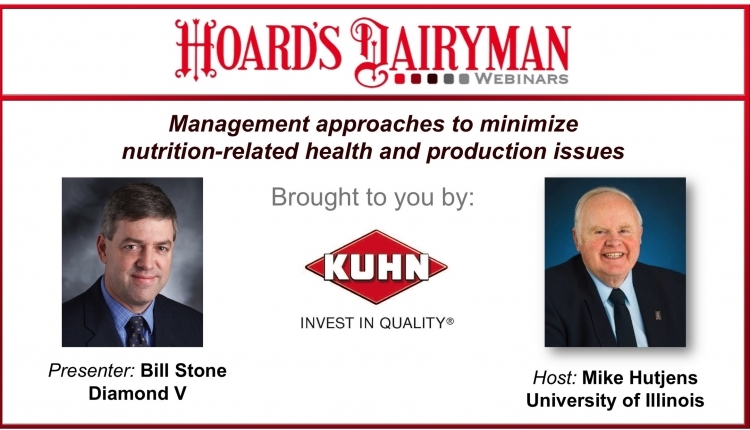 Bill Stone of Diamond V presented “Management approaches to minimize nutrition-related health and production issues” at our monthly webinar. He is very familiar with dairy, having earned both a veterinary degree and a Ph.D. in dairy management. He shared some insight into getting the most from your feed. His first suggestion was to have protocols in place. He suggested looking at the source and not always focusing on the outcome. In the case of feed, know the condition of your forages at ensiling so you are not surprised with the quality when that feed is eventually fed. Be sure to remove spoiled feeds as they will hurt normal fermentation and production will suffer. Stone reminded listeners to pull back just the plastic from bunkers that is needed and not remove too much prematurely. Weather, such as driving rains can impact silage dry matter, so keep the forage covered to preserve silage quality. To get more consistent silage from your pile, use a defacer and then mix the silage with a loader bucket before putting it in the mixer wagon. Another alternative for getting a well-mixed ration is to run just the silage through the TMR mixer before loading the other ingredients. “This is where you should take feed samples,” urged Stone. This is the silage consistency that the cows will be receiving. He also suggested running on-farm moisture samples and lab samples from the same batch to compare the consistency of the two tests. Communication is very important – all the way through the feeding chain. If the herd manager is moving cows to new pens, this will affect cow numbers, and therefore the feeder needs to know that the amount of feed delivered will change. High quality feed may not be consumed if cows are sorting due to particle length. Some suggest that one inch is long enough, while others are comfortable with two inches. Adding whey or molasses helps minimize sorting. Water works, too, but not as well. An interesting bit of research he shared was about the time of feeding. Stone showed that cows fed at about the midpoint between milkings ate at a more steady rate, consumed an additional meal, and produced more milk. He cautioned not to have an empty bunk when cows return from milking, so there still needs to be feed present to consume. That swift return from the parlor to consume fresh feed may be leading to cows gorging themselves. By keeping feed pushed up throughout the day, you are encouraging additional meals that cows will consume at a more relaxed pace. There are more great insights in the archived webinar. The presentation was sponsored by Kuhn. Mike Rankin, Hay & Forage Grower, and Mike Hutjens, University of Illinois, will review forage and crop yields, along with pricing, quality, and availability parameters. Additionally, by-product feeds will be summarized as profit margins may be challenging in 2017 and 2018. Register at www.hoards.com/webinars. The webinar is sponsored by Zinpro.